Stealth — you’re doing it wrong. 14 Responses to Stealth — you’re doing it wrong. The voice isn’t coming from him at all. There’s a dude stood behing him. Now all I have to do is comically stay behind him as he turns around in the direction of my voice. I think this old guy needs to retire if he’s sneaking up on people and announcing it! 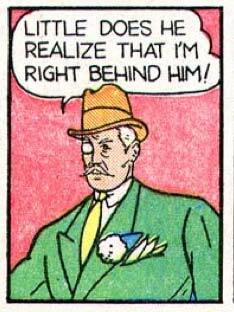 Reminds me of that one Marx Brothers film where Groucho leans in the window and says “I’m spying on you!” to the folks he’s supposed to be spying on…heh.